The Thyme Festival Seniors Art Project was a collaborative effort between the Alexandra Thyme Festival committee, Central Otago Reap and Castlewood and Ranui Rest Homes - with support from the Central Otago District Arts Trust. Clyde artist Maxine Williams was commissioned to take a series of painting workshops designed to emphasise the benefits of art and creativity for wellbeing. 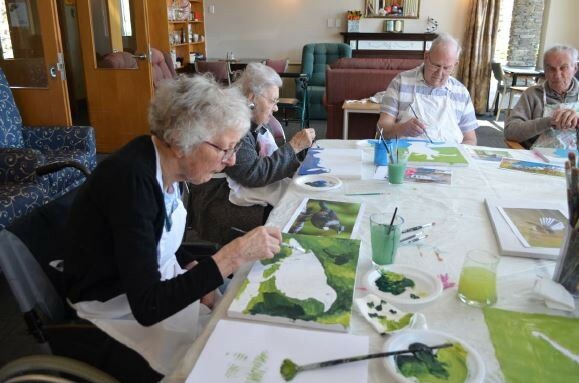 Workshops were held on a weekly basis in each Alexandra Rest Home. It is hoped that similar projects could be replicated in Rest Homes throughout Central Otago and the Central Lakes in 2019. An exhibition of 14 works by Rest Home residents will be on show at the Alexandra Library for the duration of the Thyme Festival.